As you can see in the above graph (called a "waveform"), a sound that we think of as one instantaneous event, is actually composed of several different changes in pressure. Spikes above the middle of the graph indicate higher pressure and below the graph indicate lower pressure. Areas where the curve goes further away from the center of the graph (both higher and lower) are loud. Areas where the curve stays close to the center are quiet. In this graph the loudest part of the clap is at the beginning, then it trails off over time (remember the entire graph above is only 5/100ths of a second). We used a microphone to record these changes in pressure. A microphone has a component that is susceptible to tiny differences in pressure (like a very small balloon) and couples that with a component that can change the amount of electrical voltage moving through a circuit. There are many different methods for doing this, but the end result is that all microphones convert the changes in pressure that pass over them into changes in electrical voltage that can be sent down a wire into a recording device, in this case a computer. Sound generally doesn't move any air, it simply compresses/decompresses it to higher/lower pressure for a split second at a time. Because of this, the pressure changes above and below the curve must balance out. Each time the pressure goes through all the phases: go up above the curve, come back down to the curve, continue down below the curve, and finally come back up to the curve; making one complete loop, this is called a cycle. The number of cycles per second that the sound does this is is called the rate or frequency, the unit for which is Hertz, abbreviated Hz. So if a particular sound is at 500 cycles per second, we call that 500Hz. We can also use the standard metric prefixes for it. A sound at 31,000 Hz could be written as 31kHz. Just for a reference, the human ear can detect sounds from approximately 20Hz up to 20kHz. As you can see, it takes exactly 1/2000th of a second for the wave to go from the center up, all the way down, and back to the center. Here is a longer example of the same sound to listen to (save it and open it in VLC or Audacity). You can see that this pure tone sample is a lot different than the clap example above. This is because, most sounds that we hear aren't exactly one frequency, but rather a mixed-up jumble of frequencies that we hear all together. What happens is we'll hear thousands of different frequencies each second, each for a very short amount of time. The way this happens, it that the waves of the frequencies will either work together to make that particular part stronger, or go against each other to make a part weaker. You can see in this image, that where the high and low parts of the wave are together and line up, the waves get bigger. Where they don't line up, they cancel each other out, and become smaller. This audio file will play all three tones, first 2.333kHz, then 2.000kHz, then the combination of both. By combining the correct sets of frequencies, for the correct duration, you can make any sound imaginable. As we saw before, when we combine different frequencies, it changes the height of the waves, this height (both positive and negative) is called the amplitude, and represents how loud the sound is, also known as its intensity. The higher the waves go, the louder or more intense the sound you will hear. This scale is generally measured in decibels (dB). They range from zero (0dB) being the quietest sound perceptible to the human ear (at 1kHz), to 194dB being the loudest sound that is possible to create in the earth's atmosphere. Some examples in between: calm breathing 10dB, a normal conversation 40-60dB, TV at a normal level 60dB, a busy roadway 85dB, a jack hammer 100dB, a jet engine 130dB, and a rifle being shot 160db. Loud sounds, especially when heard over periods of time, can permenantly damage part of the human ear. If you spend long periods of time (8-10hrs/day for 6 months) near a busy roadway (85dB) or if you spend even a few minutes near a jet engine (130dB), you could do serious, permant damage your hearing. To see an example of how the different intensities of sound show up on a graph, lets look at this audio track, from the trailer for the open source movie sintel, in audacity. As it plays, you can see that the louder parts show higher peaks (and lower lows) on the intensity scale. If you want to watch the video that goes with it first, you can get that here. When sound waves, or waves of change in air pressure, move through the air, they always vary smoothly. There are never any instantaneous jumps in pressure, just smooth changes in pressure that can happen in incredibly short amounts of time. If we zoom in to a small enough time, there will always be a nice and smooth curve, like the last few above. Mathematically this is called being continuous (in both time and frequency). When we make an analog recording of a sound, say on a cassette tape or vinyl record, we are recording the change in voltage output by the microphone of the continuous changes in the pressure. However, digital devices (Compact Disc (CD), computer, cell phone, etc.) are not capable of storing this continuous data. For a digital device, everything must be broken down into numbers (ones and zeros). So the digital device can record a number of the amount of voltage put off by the microphone. The catch is that it can't do it at every instant, it has a limited number of times per second that it can make a reading of the voltage and record its value as a number. The general term for this is an analog to digital conversion (A to D, A-D, ADC). Luckily modern electronics are very powerful, and can easily do one of these analog to digital conversions many thousands of times every second, each individual conversion being called a "sample". In fact they are capable of recording so fast that the human ear can't even tell that is was ever made into a digital signal! The same thing happens when we play digital audio back out. The digital device does a digital to analog conversion (D to A, D-A, DAC) to get the voltage numbers stored back to actual voltages of electricity. Then the voltage travels to a speaker (or very small speakers in headphones) which uses the change in voltage to run a device that can make rapid changes in air pressure...and we hear sound. These analog-to-digital and digital-to-analog conversions are absolutely essential for audio, but can also be applied to lots of other things as well. In fact anything that can be represented by an electrical voltage can be converted and used as a digital signal. These signals could be something as simple as setting the level of light in a room, or as complicated as controlling a car's engine when you push the gas pedal. So once a digital recording device has done an analog to digital conversion on a voltage signal, it needs to store that data digitally, even if only for a moment while it is transfered to another device, in general this is called Quantization (http://en.wikipedia.org/wiki/Quantization_(signal_processing) http://es.wikipedia.org/wiki/Cuantificaci�n_digital). 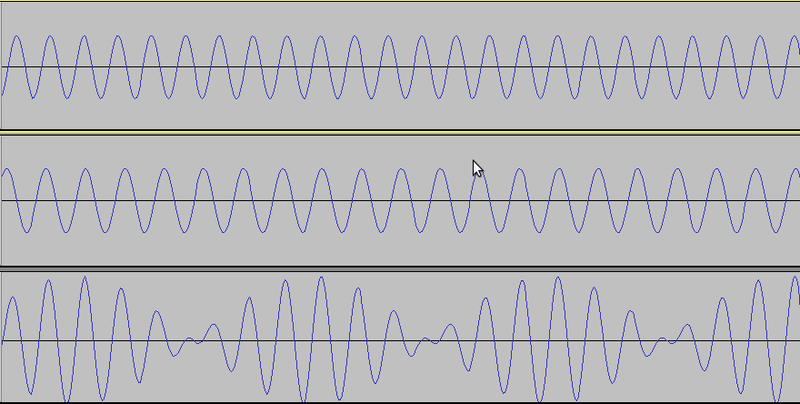 There are many ways to do this, but the most common one used for audio is called Pulse-Code-Modulation. 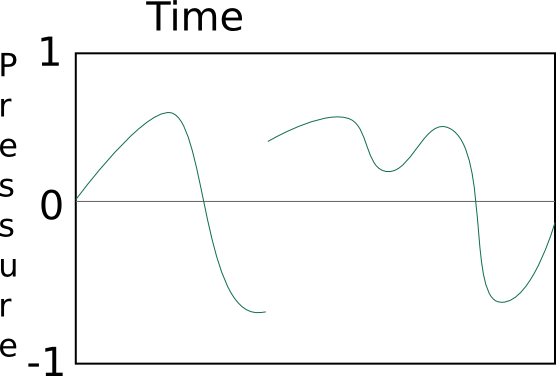 Pulse code modulation works by taking a sample at a certain rate (a set of pulses every X microseconds) and storing the value as a "code" on a scale. Here you can see an example voltage curve in red. 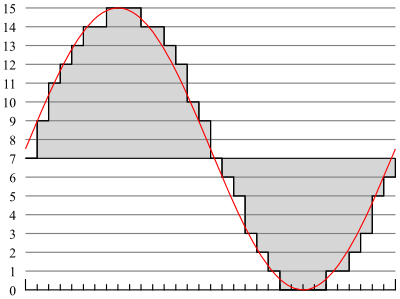 The line in gray symbolizes the respective coding for the signal (on a scale from 0-15, 4-bit). Each hash mark along the bottom is one time step. Here's another example, from the same 2kHz tone that we used above. This time the graph is only about 1/1000th of a second long (0.001 seconds). Each point that you see on the graph is where a sample of the audio was taken. One of the factors that determines how good a digital audio file sounds to a human ear is the number of bits used to store the value of the voltage that was converted to a digital signal. This is often referred to as the sample depth. When we worked with images, we used 8-bits for each of our three color channels (24-bit color). Here the most common format you will see is 16-bit which gives you 2^16 or 65,536 different possible values for each A-D conversion. This is what is used in things like CDs and iPods, however when audio professionals work in recording studios, they often use 24-bit values (2^24 or 16,777,216 possible values) for richer sounds. Using less bits will sometimes cause the audio to not re-produce the sounds very well because anything that falls outside the range of values will be clipped off. You can see that that the data that falls outside the values that can be represented isn't correctly re-produced. This can then sound like noise or muted sounds in your audio recording. In addition to 16 and 24 bit storage, there is a method of storage called "floating point". Floating point takes up 32-bits per sample, but is used differently. 24-bits of the data are used to store a value for the sample, the remaining 8 bits are used as an exponent. This means that floating point values can represent extremely tiny changes in value that are close to zero. It also means there is effectively no upper boundary on the scale (in either the positive or negative direction). An example of this can be found in the image of the 2kHz tone above in the PCM section. Notice that on the left, the scale goes from -1.0 to +1.0, instead of something like 0 to 65535. This is the typical way that floating point values are written. In floating point, the signal is free to go above 1.0 or below -1.0 without loss (there is no clipping in floating point). Because of this, floating point values are often used during the recording and/or editing process. The other major component that affects how a digital audio recording sounds is the number of A to D samples that are taken every second, also know as the frequency. This number is usually denoted in Hertz (Hz) which simply means "cycles per second". The most important aspect to choosing a sample frequency is the Nyquist theorem. The Nyquist theorem states that to accurately re-produce a sound, you need to have a sample rate that is twice as high as the highest frequency you need to re-produce. As was explained before, the human ear can typically hear frequencies up to about 20,000Hz or 20kHz. This means that the minimum frequency that we need to accurately re-produce sound is 40kHz. However there also needs to be some extra room to filter out any stray (non-audible) frequencies, so the most common recording frequencies are 44.1kHz for CD audio, and 48kHz for typical digital audio. There are also some formats specially designed for recording that go to 96kHz or beyond, and this is to allow for the creation of even better filters for the non-audible frequencies. Just because it takes at least 40kHz to accurately record everything the ear can hear doesn't mean that lesser frequencies are not in use. For example on telephones any time a land-line call goes outside the neighborhood or any time on a cell phone the audio is digitized at an 8kHz frequency. This sounds alright when you just need to hear what the person on the other end is saying, but would sound awful if you tried to listen to a musical performance digitized at 8kHz. In this day and age however, an audio engineer would only look at using a sample frequency lower than 40kHz if there were serious bandwidth or storage constraints. For this course we will use at least 44.1kHz or 48kHz audio. Endianness is an artifact of the growth of computer technologies in different organizations at the same time. This refers to the way bytes are stored in a computers memory. The details of it aren't important for digital media creation, just know that there are two different formats: Big-Endian and Little-Endian. By themselves they aren't compatible, but it is trivial for software programs to convert between them. The channels used in digital audio are different from how channels were used in images. In this case, each channel is a completely separate recording, that just happens to be set to play back (and is often recorded) at the same time. The channels are usually used to represent the direction that the audio can come from.